I came up with the recipe when trying to use up some frozen shrimp we had leftover from New Year’s Eve. 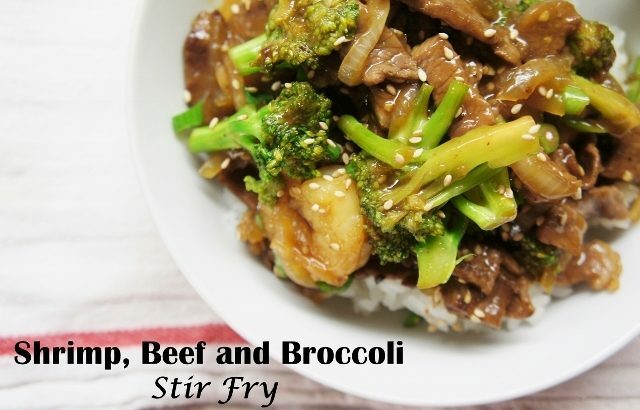 Beef and broccoli stir fry has always been a favorite of mine so I would have never thought to mess with such a great dish, however sometimes trying something different results in a new favorite! 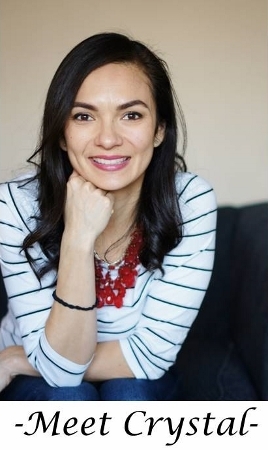 What I love about this recipe is that it is so versatile. You can leave out the shrimp, substitute chicken for the beef, or omit meat all together if you choose. 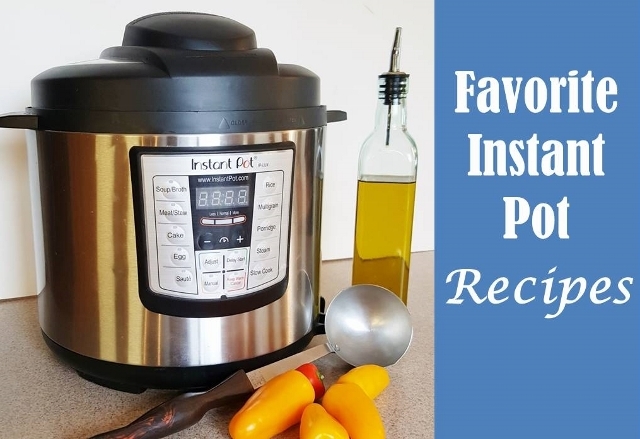 In addition, I often add whatever vegetables I have available in the fridge such as red and green bell peppers, zucchini , and even baby corn, making this a great way to use up leftover veggies. 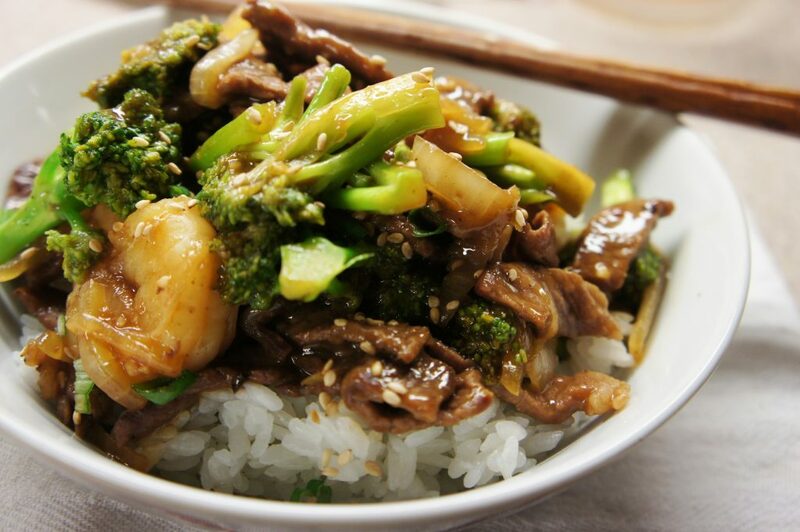 For me though, the classic beef and broccoli stir fry with the addition of shrimp is where it’s at and it never fails to disappoint. 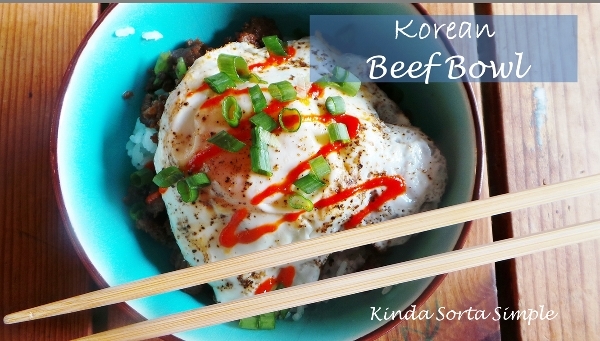 I bet when you try this dish it will be a hit for you too! Who needs takeout when you can have the real deal? What is a dish where you tried something different and ended up loving? I like to marinate the beef in its own sauce before cooking it and then adding the stir fry sauce later as I feel it gives it more flavor, however if you are pressed for time feel free to skip the marinade and just go straight to cooking the beef in the oil. This is a perfect dish for anyone who wants a delicious dinner that takes little time and is versatile enough to use up leftover vegetables from the fridge. In a medium bowl whisk together beef marinade ingredients: soy sauce, cornstarch, ground pepper, garlic powder, brown sugar, and water. 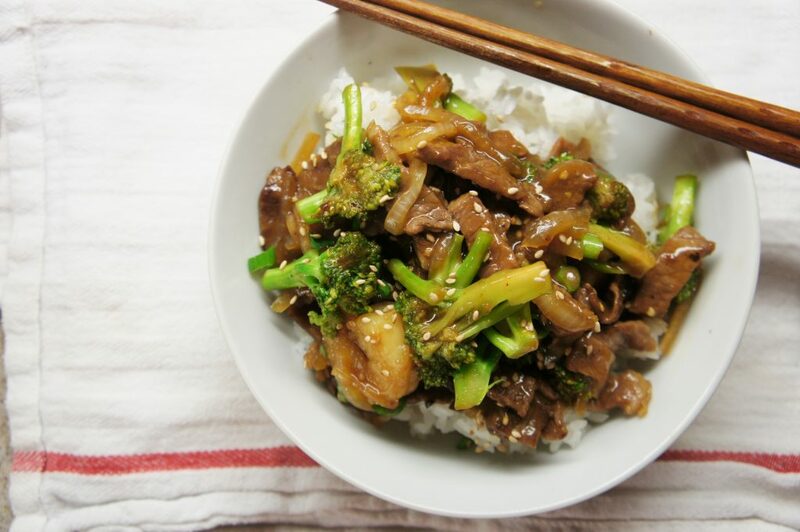 You can either let the beef marinade for up to an hour in the fridge or begin to stir fry right away. In a small bowl whisk together stir fry sauce: cornstarch, soy sauce, brown sugar, garlic, and sesame oil. Set aside. Heat a large frying pan over medium-high heat and add 1 tbsp of vegetable oil. Add beef and cook until no longer pink, about 3-4 minutes. Remove from pan and set aside. In same pan heat 1 tablespoon vegetable oil over medium-high heat and add shrimp. Cook stirring occasionally until pink, then add onion and broccoli and stir 2-3 minutes or until tender. Whisk then add stir fry sauce into pan and stir well. When sauce begins to thicken add beef and stir until well combined, about 1-2 minutes. Serve immediately over rice or noodles and garnish with sesame seeds, green onion, and optional red pepper flakes. 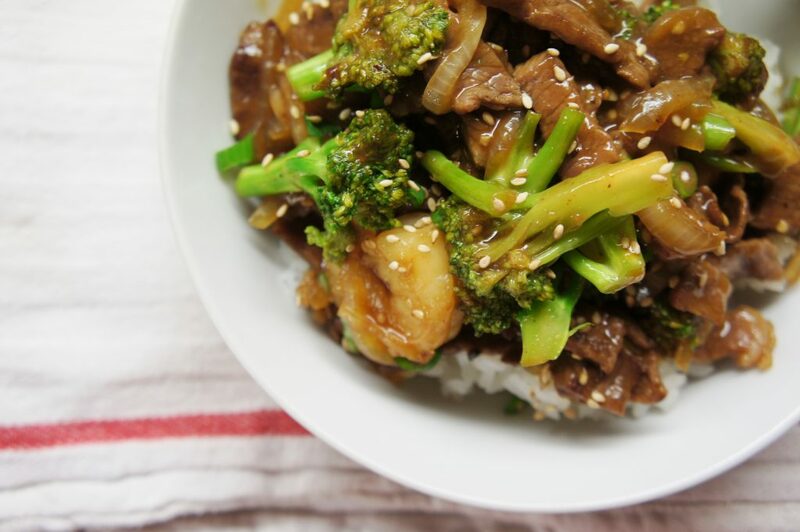 All, Food, Uncategorized beef, broccoli, food, shrimp, stir fry. permalink. I’m always looking for quick, yummy meals. 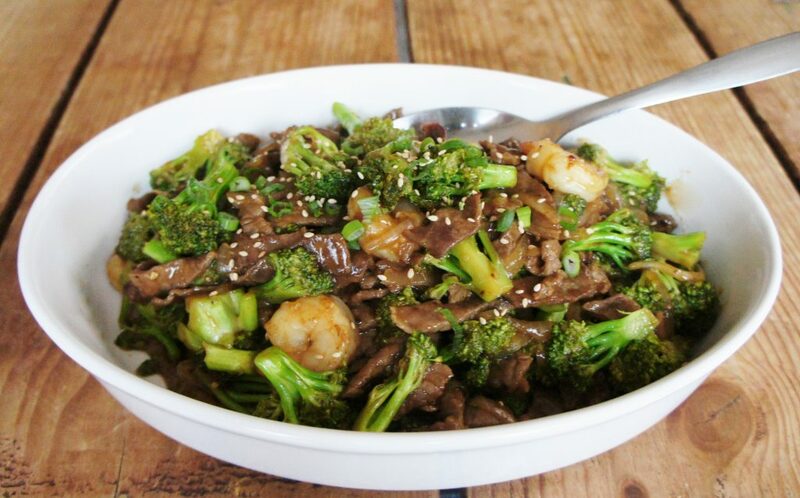 I printed off your Shrimp, Beef and Broccoli Stir Fry recipe and cannot wait to try it. 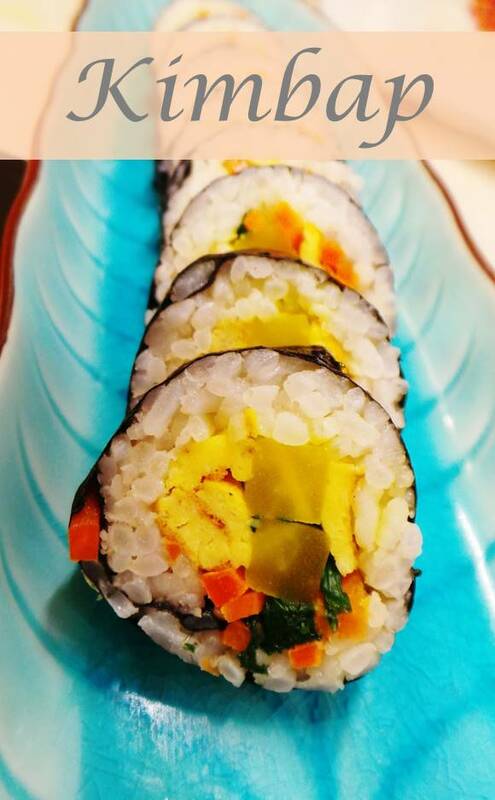 Love your posts Crystal, now I’m hungry:) Thanks for sharing! Thank you so much Bess, I appreciate it. You’ll have to let me know how it turns out! Delicious! Added shredded purple cabbage at the end for crunch and colour. This was easy…and delicious. Thanks loads!!! Yay, that’s awesome Lori, let me know how it turns out!